Let your hair soak up this creamy moisturizing shampoo, conditioner and hair mask blended with our Coco Creme recipe that softens while it cleanses. After shampooing and conditioning (sold separately), work thoroughly into wet hair and let sit for 3-5 minutes. Can also be used as an overnight hair mask for more intense moisture. CD COCO CREME CONDITIONER 12 fl. oz. Ingredients: 43238 CD6 - Aqua / Water / Eau, Cetearyl Alcohol, Cocos Nucifera (Coconut) Oil, Parfum (Fragrance), Behentrimonium Chloride, Sclerotium Gum, Caprylyl Glycol, Isopropyl Alcohol, Salicylic Acid, Glyceryl Stearate, Mangifera Indica (Mango) Seed Butter, Astrocaryum Murumuru Seed Butter, Glycerin, Potassium Hydroxide, Linalool, Benzyl Alcohol, Coumarin, Caramel, Cocos Nucifera (Coconut Milk) Fruit Extract, Xanthan Gum, Potassium Sorbate, Tocopherol (Vitamin E). F.I.L. D210974/1. 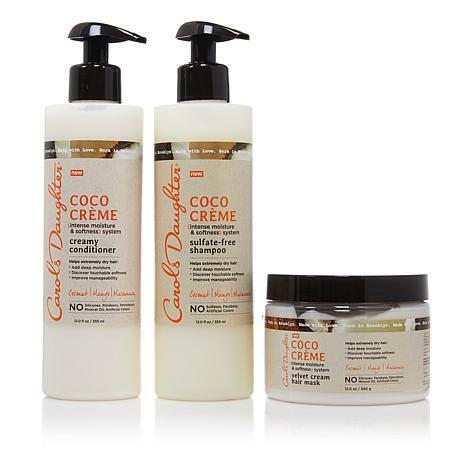 CD COCO CREME HAIR MASK 12 oz. Ingredients: 43239 CD1 - Aqua/ Water/Eau, CetearylAlcohol, Cocos Nucifera (Coconut) Oil, Behentrimonium Chloride, Glyceryl Stearate SE, Butyrospermum Parkii (Shea) Butter, Parfum (Fragrance), Isopropyl Palmitate, Benzyl Alcohol, Isopropyl Alcohol, Sclerotium Gum, Caprylyl Glycol, Salicylic Acid, Mangifera Indica (Mango) Seed Butter, Astrocaryum Murumuru Seed Butter, Glycerin, Linalool, Coumarin, Cocos Nucifera (Coconut) Fruit Extract, Xanthan Gum, Potassium Sorbate, Tocopherol (Vitamin E), Citric Acid. F.I.L. D210057/1. Ingredients: 43238 CD6 - Aqua / Water / Eau, Sodium Cocoyl Isethionate, Disodium Laureth Sulfosuccinate, Sodium Lauryl Sulfoacetate, Sodium Lauroyl Sarcosinate, Cocamidopropyl Betaine, Glycol Distearate, Parfum (Fragrance), Divinyldimethicone/Dimethicone Copolymer, Glycereth-26, Decyl Glucoside, Hydrogenated Coconut Acid, PPG-5-Ceteth-20, Polyquaternium-7, PEG-55 Propylene Glycol Oleate, Propylene Glycol, Sodium Chloride, Amodimethicone, Polyquaternium-10, Potassium Hydroxide, Sodium Isethionate, Carbomer, C11-15 Pareth-7, Benzoic Acid, Glycerin, Mangifera Indica (Mango) Seed Butter, Cocos Nucifera (Coconut) Oil, Astrocaryum Murumuru Seed Butter, Laureth-9, C12-13 Pareth-23, C12-13 Pareth-3, Trideceth-12, Benzyl Alcohol, Sodium Benzoate, Magnesium Nitrate, Phenoxyethanol, Linalool, Sodium Acetate, Salicylic Acid, Cocos Nucifera (Coconut MilK) Fruit Extract, Isopropyl Alcohol, Methylchloroisothiazolinone, Sorbic Acid, Magnesium Chloride, Methylisothiazolinone, Xanthan Gum, Potassium Sorbate, Tocopherol (Vitamin E), Citric Acid. F.I.L. D211560/1. I absolutely love this set. My wash and go style is much more defined now. The shampoo alone, adds moisture to my thick hair. This 3 step process is magic! I have dry curly hair that I straighten. This system moisturizes my dry hair and helps keep the frizz at a minimum. Excellent, my hair is already healthy, but the cold winter was making it really dry. This gave it so much moisture and it smells delicious. My new favorite over Monoi.